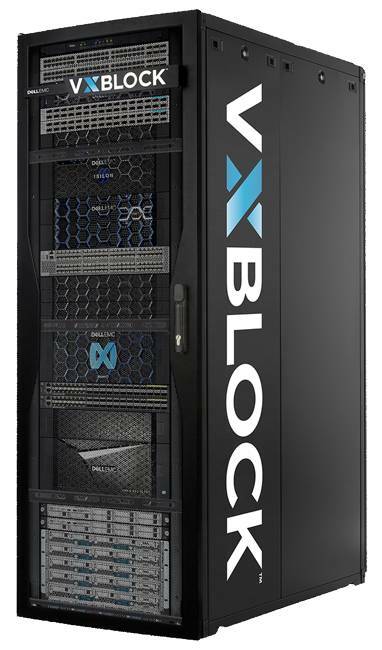 Dell EMC has smushed its three-product VxBlock range into a single, more scalable composable infrastructure – the VxBlock 1000. VxBlocks are rack-scale systems converging separate servers, storage and networking into a single converged infrastructure (CI) system orderable as a single product, and delivered and installed ready to turn on. The VxBlock 1000 is more converged than the existing VxBlocks, but not a hyperconverged product, like VxRack, which is based on Dell server nodes and ScaleIO software. We can think of the VxBlock 1000 as a composable infrastructure product, although Dell EMC does not use the term here. The VxBlock 1000 covers all three workload areas and embraces two types of servers, four kinds of storage array, extended data protection options and composability in order to do so. The server support has expanded from Cisco's UCS B-Series blade servers to add Cisco's C-Series rackmount servers: C220 M4 (SFF and LFF), C240 M4 (SFF and LFF), C220 M5, and C240 M5. This doubling down on Cisco emphasises Dell's commitment to Cisco UCS server use in VxBlocks. As with current VxBlocks, Cisco Nexus LAN networking and MDS SAN networking products are used. The VxBlock 1000 can use four different kinds of storage array. The Unity, VMAX and XtremIO arrays are all-flash whereas the Isilon arrays are all-flash or hybrid SSD/HDD. Up to ten arrays can be supported but there is no hard and fast upper limit, and we understand up to 20 arrays have been tested internally. There are no specific sub-configurations, such as a VxBlock XtremIO/C-Series one. Instead, customer workload needs are used to construct a VxBlock 1000 dedicated to that profile. XtremIO storage could be used for a SAP workload with Isilon arrays used for unstructured data. The inclusion of Isilon expands VxBlock workload coverage and could hinder the take-up of competing file storage arrays inside Dell EMC's installed base. In general, Dell EMC says, the VxBlock 1000 can reduce the data centre footprint of the component products and their management cost. View the VxBlock 1000 as having pooled server, storage and data protection resources. These can be carved out and allocated as a logical VxBlock to individual applications. When the application has finished, resources are returned to the pool. It's easy to see how VDI workloads could be given specific resources in this scheme. A VxBlock 1000 could have a logical VxBlock 740 setup, for example. There are APIs for programmatic control of this, and Cisco's Vscale technology contributes to this resource pooling. Dell EMC's storage division president Jef Boudreau said: "With Vscale Architecture, shared resource pools of Cisco compute, Dell EMC storage and data protection are connected through the Vscale Fabric, which is a software-defined Cisco spine-leaf network. These 'logical' converged systems are managed, supported and sustained with the same low OpEx, high availability and agility as a VxBlock System." AMP-VX (Advanced Management Pod) is a centralised management system supporting up to eight individual VxBlock systems. It uses from 4 to 64 Dell PowerEdge R640 gen-14 rack servers, not Cisco UCS ones, with up to 3TB of DRAM, a 960GB cache SSD and 4 x 3.84GB SSDs. Network features include 1 x 20 Core, 2.4Ghz, network 1 x quad port 10 GbitE Base-T (X550), and 2 x dual port 10/25 GbitE SFP + NIC. This is far from your average 1GbitE management interface. It includes Avamar Virtual Edition software with an integrated Data Domain appliance for management infrastructure protection. Vision Intelligent Operations, as used in the existing VxBlocks to provide management intelligence and visualisation, is also present. The software set includes Vision, Unisphere, InsightIQ (Isilon), Secure Remote Services (ESRS), Cisco Data Center Network Manager (DCNM) for LAN and SAN, and Microsoft Windows Server. In this respect VxBlock 1000 is similar to HPE's Synergy composable design, which also features a separate management server system. Existing VxBlock users, such as VxBlock 340s, can do a software upgrade to a Vx1000 configuration incorporating Vscale. There is no rip-and-replace upgrade here. The VxBlock 1000 does not replace the existing VxBlocks. However, over time it's envisaged that they will be enveloped by the VxBlock 1000 and, in all probability, the installed base will upgrade to it. Next-gen technologies, including NVMe drives and fabric storage, UCS generation 4 servers, VMware Validated Design (VVD), and XtremIO X2, are planned for future release later this year. We understand that Dell is committed to using Cisco UCS servers in VxBlocks in perpetuity. 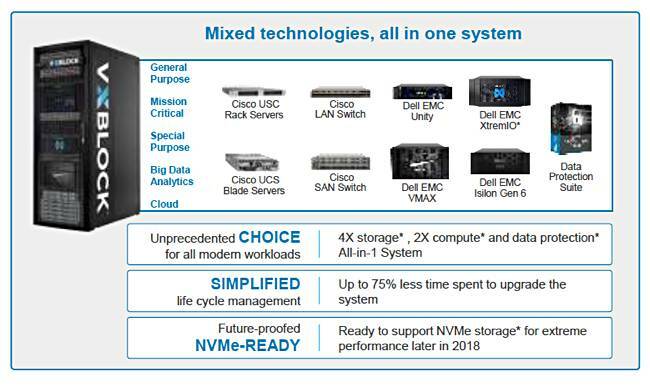 The UCS ecosystem is highly important to Dell and it has no intention of replacing them with its own PowerEdge brand; the AMP-VX being a special case. We see the VxBlock 1000 as a seriously big iron with its support for up to 800 C-Series rackmount servers; an Intel mainframe in a way. It will be interesting to see if, over time, the four different physical storage arrays supported evolve to a smaller number of hardware platforms supporting the same use cases. Making the VxBlock composable is Dell EMC's response to HPE's Synergy system and also makes comparable in the composability sense to Kaminario's K2 array and its Cloud Fabric software product. We're sure the granularity, depth and scope of composability will provide lots of material for marketing and sales presentations: as in "My composability is better than yours" and "true composability means [add definition here]". Notwithstanding that, the VxBlock 1000 looks to be seriously competitive advance on existing VxBlockery and Dell EMC CI customers could take it up in droves. * Up to 800 C-Series rackmount servers or 400 blade servers.